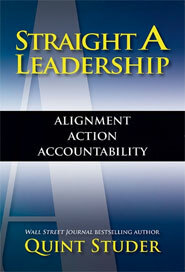 Click here to access the Straight A Leadership chapter tools. 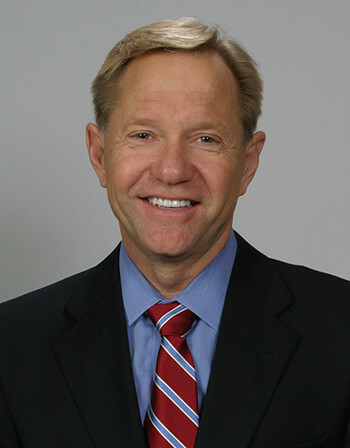 Straight A Leadership, a book by Wall Street Journal bestselling author Quint Studer, can help your organization achieve the peak performance it needs to survive in the toughest environment. Alignment - Think of C-suite leaders as aircraft pilots. If a pilot makes even a tiny error in setting longitude or latitude at the start of the flight, the plane can end up in the wrong city. Likewise, a small misalignment at the top echelon of a healthcare organization can spark problems that multiply as they cascade through the leadership hierarchy-causing everyone to veer off course. Action - Sometimes an organization is implementing the right action plan but it's being poorly executed. Other times, so many actions are taking place that they're working against each other, in the way that multiple medications can interfere with each other's effectiveness. Either way, the impact of each action is diminished or desired results go completely unmet. Accountability - An organization may be properly aligned and taking the right action steps, but without a good system of accountability in place, it will get only short term gains. The absence of accountability-for selecting the right talent, teaching the right tools and techniques, validating positive behaviors and evaluating overall performance-can derail long term results. Straight A Leadership offers a wealth of thoughtful, evidence-based insights on addressing the three "A's" in light of an organization's external environment. It also shows senior leaders how to evaluate their own execution in these areas and provides a "tool kit" that will help them get the organization moving in the right direction. It's the perfect book for any leader who wants to stay on the cutting edge in making their organization the best.